I made the cookie a year ago for the milk bottle concept project. Last time it was done in Cinema4D, now I decided to render it with Mantra. I started modeling from a cube which was scaled in Y axis. I subdivided it few times, so I got kind of 'pancake' mesh. After that, I tried to create fully procedural cookie: I used many types deformers/restriction tags in order to build a proper mesh. I decided to make it high-poly. But, after awhile I realized, that it would be simpler to paint proper textures instead of trying to manage millions of polygons. 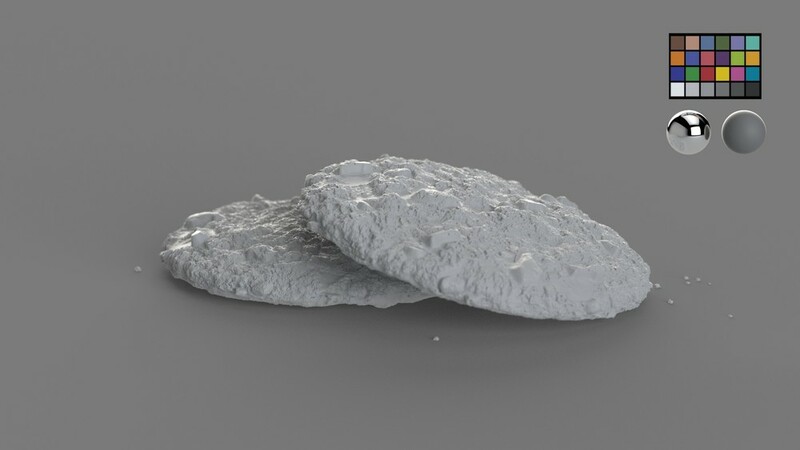 In order to do this, I simplified the mesh (pancake again:) ), took few photos of cookies (which I bought a day before) by using my cell phone and created a displacement map from these photos using Knald software. Then, I used Mari to project textures on my simple geometry, corrected displace a bit and that's it). The texture size was 4K. There is nothing special in the project. I used the corrected displacement map to drive specular roughness, specular intensity, and SSS. When I rendered it in Houdini, I just added high-frequency noise to the existing displacement in order to get a more crumbly surface.